Oh your work is just Devine. The work with the poinsettia is just out of this world. The set is to die for but you have done an amazing job showcasing it. Just beautiful. Pick me, pick me please. Pick me, pick me!! Very beautiful work! I love your white poinsetia, it is gorgeous. Sigh.. Those flowers are gorgeous!!! OMG what a beautiful job of painting those poinsettias. Thank you so much for sharing this technique. And I love using Wink of Stella instead of water – shine on! The white poinsettia’s are beautiful. You’ve done a wonderful job of highlighting them. love the poinsettia card! So beautiful!! Wow, both cards are stunning! Love your coloring and these white poinsettias are drop-dead beautiful! Wow!!! Your cards and videos are awesome! I especially love the white poinsettia card! It is stunning! Sandy, Your coloring is so beautiful and realistic. 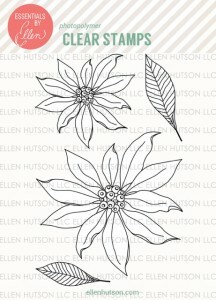 I would love to be able to make a poinsettia card like yours. The added crystal accents are the perfect finishing touch too. What a beautiful pointsettia!Your card is just gorgeous. Thanks for the cjance to win! Love, love, love your card, so beautiful. You made the Poinsettia set really stand out, will have to rethink my favourites from this release now. Great work! Love, love, love your poinsettias! SO beautiful. I love white poinsettias. I don’t know if I would have the patience for the coloring, but I’m willing to give it a try! I absolutely love your card. It is so classic and elegant! I always love your coloring because you make everything look so realistic! You are so great with the shadows, picking out the colors and blending; just great! These cards are no exception! The poinsettia looks exactly like they do in real life! And the Halloween card is just so awesome! I love the white poinsettia card, it is just simply beautiful, so beautiful that I can’t explain how lovely it is! I love this stamp set, it is my favorite out of the whole release. Thanks for the inspiration. Love your artistic approach and manageable steps to take, much appreciated! I just love this white poinsettia card! Beautiful in every way! Great cards. Particularly like the white poinsettia. Great ideas and great examples of how to do the coloring. Thanks! Love the cards. Awesome coloring as always. I love the colors and design of the poinsettia card! Beautiful card!! The new sets are gorgeous and can’t wait to get them! Your colouring is so spectacular and you have brought the stamps to life! Stunning poinsettia card with a great video to share technique. You made these stamps sing!! Thank you for all the inspiration, tips and new product how to’s. Most Grateful! Sandy I want to thank you for opening my eyes even wider than I have had them open. YOU have shown me so much in tec’s that I have changed the way I due my creating. These Poinsettias are great. They are my mother’s birth flower. She will love this card, but I think I will do mine in pinks to a red tone. Your HEX chart is great and your color wheel. I have all your classes so far and watch all you videos. I learn something new ever time I watch them. I wish you lived closer so I could take some of your classes. Well, the blog and you tube has to do…keep them coming…love ya and keep up the creative juices!!! I love the poinsettia card! BRILLIANT!! Love this tutorial on painting white flowers! Thank you so very much, I will try it out when my AMAZING EH stamps come to my door. I am so excited! What gorgeous cards you make!!! and i love the watercolouring…. just beautiful! Beautiful cards! I also like fun Halloween cards! Love how you have watercoloured the poinsettia. TFS. What beautiful poinsettias! I can’t wait to see the video for the pumpkin patch. You sold me on the stamp set! Absolutely gorgeous! I’ll need a couple months off of work to practice this ! Gorgeous poinsettia card! Awesome new release!! Love both cards, but that poinsettia is amazing! I have never seen anyone do a white poinsietta……….beautifully done. I made some red poinsietta’s last year and used clear crackle paint to give a vintage look. Bet that would look beautiful on the white poinsietta as well. Will have to give it a try!!! The poinsettia card is so pretty and easier to make then I thought when I first saw it. OH MY GOODNESS, That Pointsetia is absolutely gorgeous! Love the halloween to but the other one is my favorite. Thanks for sharing your video, it really helps! Love this release! Love the card you did. Amazing!!! !